A comprehensive list of all my travel beauty necessities! I discovered this scent last year while perusing the Tom Ford counter at Sak’s. My friend mentioned it smelled like sunscreen and I of course had to investigate! I immediately fell in love with the scent, a medley of all aroma’s of a sunny vacation. 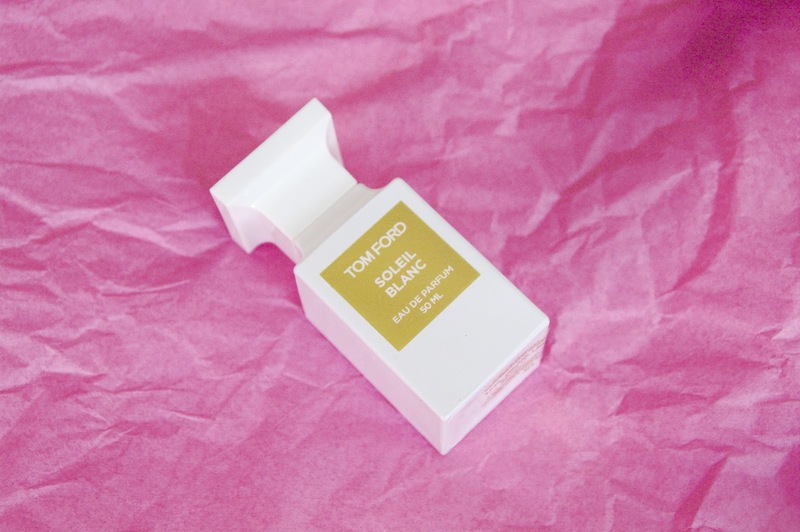 Notes of sweet tropical fruits, coconut and sunscreen. I wore this all last summer and will probably follow suit this summer. It is an absolute must for a sunny vacation. The olfactory nostalgia immediately brings me back to my childhood March Break vacations with my family in Miami Beach. This sunscreen is light enough to wear on your face, which is perfect for travelling, as it means packing one less item! It was recommended to me specifically for the light formula, as I have fair, sensitive skin. Finally, it doesn’t have that typical ‘sunscreen scent’, though if I’m honest with you I love that smell, hence my affinity for Soleil Blanc! Just incase you do get a bit more sun than expected this après sun from La Roche Posay is a dream. Last year I attended my cousin’s graduation ceremony…sitting out in the sun for three hours straight in late June. I returned home that evening to find two bright red triangles on my legs from sitting cross-legged in a short skirt. I purchased this and applied it in the morning and before bed and it helped to soothe the pain of the burn, as well as enhance my skin’s ability to heal itself. 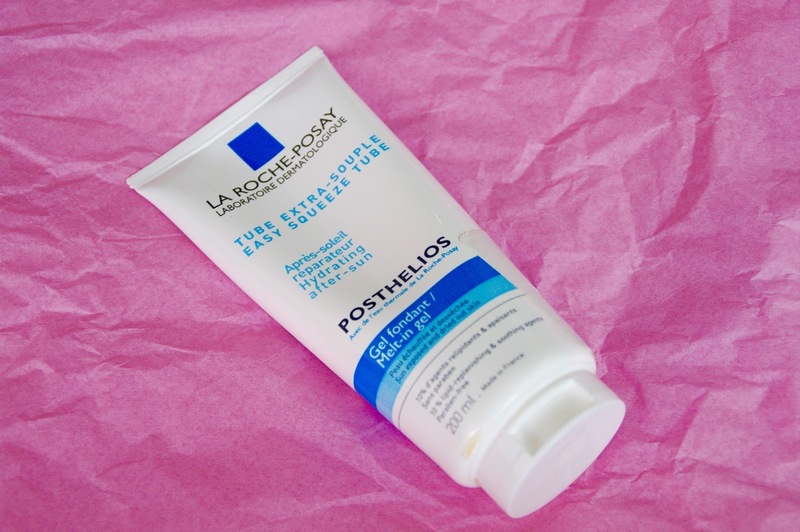 If you’re travelling via plane you are going to want a quality moisturizer on hand. The air on planes is intentionally dry, because dry air is lighter than moisture-heavy air, making a dry aircraft more fuel-efficient. This, however comes at the expense of glowing skin. Have on-hand an effective moisturizer to bring your skin back to life. It’s also nice to have if you get a bit more sun than anticipated! Last year, while in Austria I read about the beauty regime of the countyr’s prized empress, Elisabeth, who was said to have travelled with a heard of goats in order to take luxurious baths in their milk. 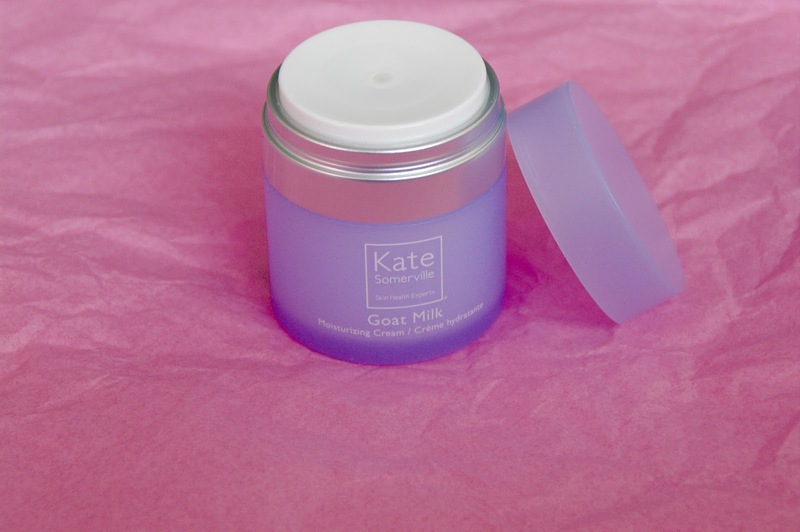 Ever since, I have been obsessed with Kate Somerville’s Goat Milk Moisturizing Cream. 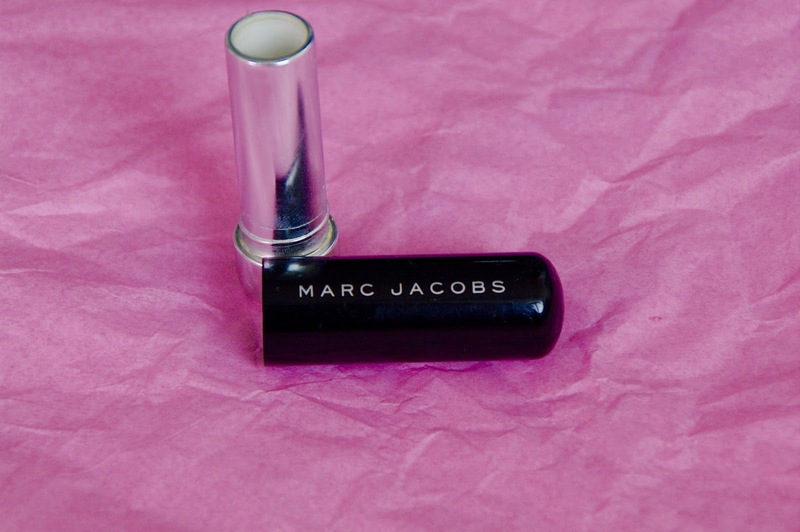 This is another great item to keep in your purse/carry-on whilst on the plane. Make sure your balm has SPF in it. Your lips need shelter from the sun, just like the rest of your skin. I always bring my own water bottle with me when I travel. When we’re travelling we tend to be more active, we are out and walking around and may not have access to water as easily. We also tend to spend more time in the sun. Water is one of the most important aspects of any beauty regime, at home, or abroad. Make sure you’re well prepared and well hydrated! I’m actually notorious for forgetting to empty my bottle before airport security. Just be sure to bring it empty beforehand, most airports have water fountains at which you can fill up before boarding. You’re definitely going to want to have available water on those dry planes. I like being able to fill my own bottle as it prevents plastic waste and saves money on having to buy water while out and about. If you decide to bring your own bottle though, do be sure to research the quality of drinking water where you’re travelling and make sure tap water is safe to drink! For added skin protection, bring an over-sized hat. Floppy hats are great because they pack well! 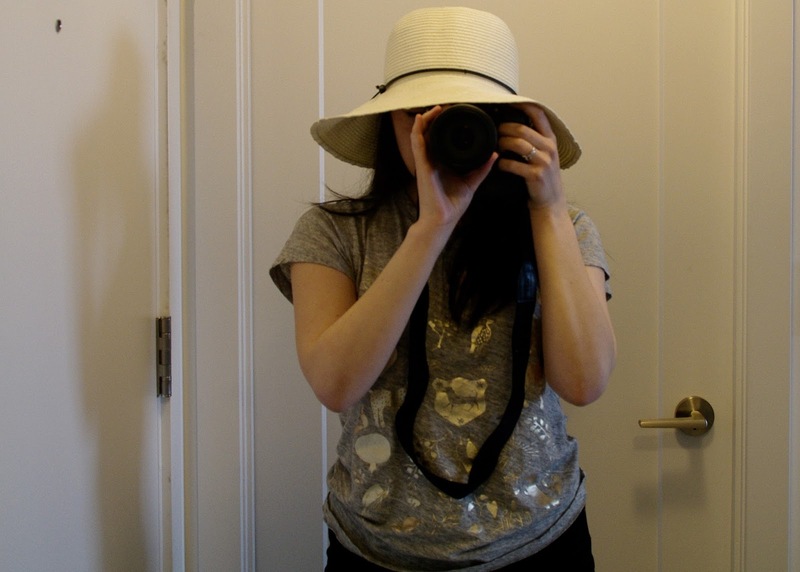 I love a faux straw hat, such as this one I picked up at Aritzia last year. One fashion and beauty essential that I believe should always be an investment is a good pair of sunglasses. I like an oversized pair with dark lenses. I actually had the lenses replaced in my Chanel sunglasses at an optical store with pitch black, polarized lenses, which are designed to remove glares so you aren’t blinded by the sun’s reflection off any glass, or metal objects). You can actually end up doing more damage to your eyes with an ineffective pair of sunglasses than by wearing none at all. The dim glass of sunglasses causes your pupil to dilate, allowing more damaging light to enter the eye and without 100% UV protection your eyes are at risk for greater harm than with no sunglasses at all. I chose this bag specifically for travel. Though I use it to store my day-to-day makeup I wanted something I could take with me on vacation which would carry everything I need. The top holds brushes, so they are kept safe and clean and there’s enough room inside for all my makeup and beauty needs. It is also waterproof just incase anything leaks! 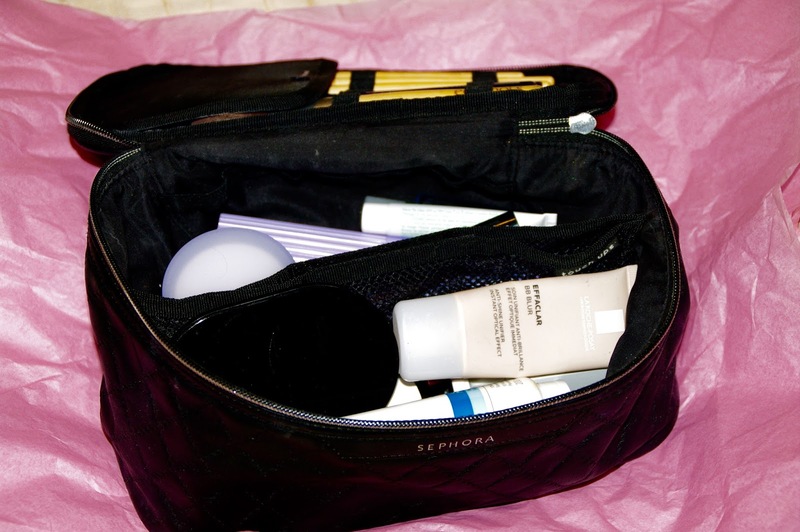 Share below your travel beauty essentials!